Ou je devrais dire: Je comprends. Ceci n’est pas un vase. It is anything BUT opaque, that I can be confident of. Not with you! And it’s morphing in front of our eyes. Oh, and your brain, let’s not leave that out. My brain on color…. sizzle. Thank you. 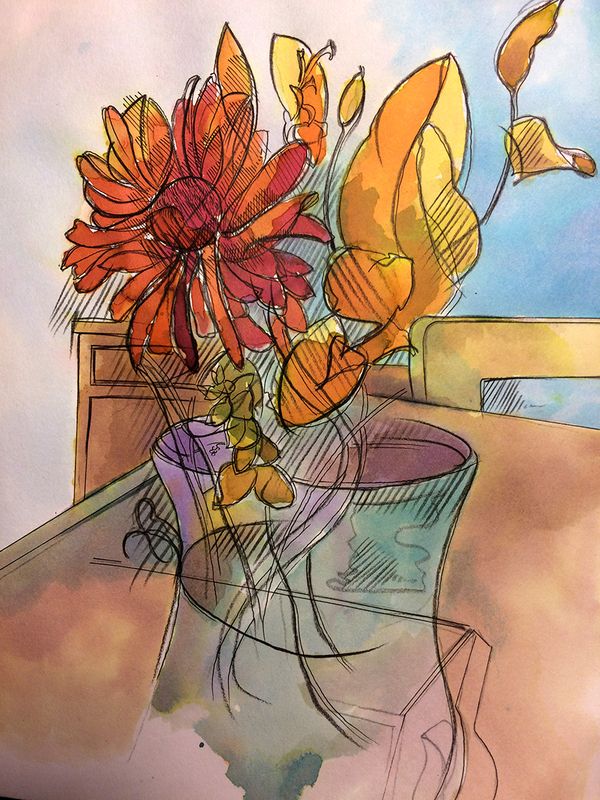 It might not be a vase, but it’s a lovely drawing – delicious colour! Sometimes, a boy just has to have fun. I feel like I’m walking around the (not a) table. I’d love to watch a YouTube video of you doing this. Stunning. That would be hysterical. I am not a calm artist. I get up and down, fidget with my pen or brush, get frustrated, panic, happy, and on and on.